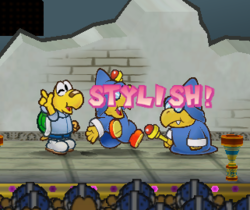 Stylish Moves are extra action commands in Paper Mario: The Thousand-Year Door and Super Paper Mario that accompany every attack in the game. It is up to Mario, Goombella, Koops, Flurrie, Mini-Yoshi, Vivian, Admiral Bobbery, and Ms. Mowz to use these moves by themselves. When Stylish Moves are executed, the crowd in front of the battle stage becomes even more wild, providing more Star Power than a normal Action Command to use for special moves. Some attacks have multiple stylish moves. To do a Stylish Move, the player must press at a certain time during an attack. Buying the Timing Tutor badge from Charlieton in Rogueport reveals a ! when the player should press , and this (along with talking to Eddy the Mask) is the only in-game way to learn all the Stylish Moves. In Super Paper Mario, Stylish Moves are completely different. All characters have the same stylish moves. The player can chain stylish moves in this game, going from "Nice" to "Good" to "Great" to "Wonderful" to "Excellent". There are various ways to do stylish moves. They all begin by jumping on an enemy. Note that because Mario has no SP in this game, Stylish Moves simply serve to give the player more points, and thus level up a little faster. Fire Drive Press right after Mario hits the fireball. The player wants to press before the fireball reaches the top of its arc. 1 Mario spins in place, thumbs-upping the crowd. Hammer Press immediately after Mario strikes the enemy. 2 Mario backflips. Press right when Mario lands to make confetti come down. Hammer Throw Press right after Mario throws the hammer, then as he touches the ground. The player wants to press for the first Stylish Move before the hammer reaches the top of its arc. 2 Mario flips, then confetti comes down if performed correctly. Jump Press at the high point of Mario's second jump, then again at the high point after he jumps on the enemy a second time. In order to execute the second Stylish Move, the player has to press when Mario lands on an enemy the second time 2 Mario bellyflops onto the enemy for the second jump, and belly flops again the second time. Multibounce Press at the height of each of Mario's bounces No. of foes - 1 Mario either bellyflops onto the next enemy or kicks while jumping. Power Bounce Same as Multibounce Unlimited Same as Multibounce, though tougher to pull off. Power Smash Press immediately after Mario strikes the enemy. 4 Mario backflips. Press right when Mario lands to do another, once more to do a triple backflip, and a final time when he lands to make confetti come down. Quake Hammer Press when Mario is upright after Quake Hammer, before he moves. 2 One high backflip, then confetti comes down. Spin Jump Press when Mario is at the height of his first jump onto the enemy, not the Spin Move. 1 Mario forward somersaults during the jump. Spring Jump Press at the highest point of his arc after Mario spin jumps. 1 Mario bellyflops on to the ground. This Stylish Move does not give much Star Power. Super Hammer After hitting the enemy, press on Mario's fifth spin. 1 Mario thumbs-ups the crowd after he swings his hammer. Tornado Jump Press when Mario is falling back to the ground and again when he's back where he started. 2 Mario cartwheels back to his side of the battlefield, then confetti comes down. If the second command is attempted early and failed, the Star Power will not be awarded until after the player's next move (this includes changing partners with Quick Change equipped). Body Slam Flurrie Press a split-second when Flurrie touches the ground. 1 Points her little finger up. Bomb Bobbery Press a split-second when Bobbery lands back on Mario's side of the field. 1 Salutes the sky. Bomb Squad Bobbery Press when the third bomb is at the top of its arc. 1 Same as Bomb. Gives very little Star Power. Fiery Jinx Vivian Press right as Vivian is pointing her finger. 1 Vivian clasps her hands together and smiles. Ground Pound Mini-Yoshi a) Press when Yoshi is just above the enemy but when the bar is still shown; b) Press when Yoshi does his second bounce. 2 a) Extra backflips before Yoshi ground pounds; b) Jumps happily before moving back to Mario's side. Gulp Yoshi Kid Press about half a second after the enemy is released. 1 Same as Ground Pound b.
Headbonk Goombella Press when she pauses before the bonk. 1 Forward flips before actually bonking. Infatuate Vivian Press right after pressing for each heart. The player wants to press when they see a heart appearing next to Vivian. No. of foes Small hearts appear around Vivian. Love Slap Ms. Mowz Press as Ms Mowz is walking back to Mario's side. 1 Hops once when you press . Gives very little Star Power. Kiss Thief Ms. Mowz Press on the way to the front enemy, not after. 1 Does a quick somersault. Mini-Egg Yoshi Kid Press a half-second after the last egg is thrown. The player want to press as the last egg hits an enemy. 1 Same as Ground Pound b.
Multibonk Goombella Same as Headbonk, then again in mid-jump to do another flip. 2 A flip when jumping, then another if second command is performed correctly. Power Shell Koops Press a split-second when Koops returns to his position, again as he spins for 1.1 to 2 seconds approx. 2 First Koops spins on his head, then points at the ceiling. Rally Wink Goombella Press a second as the heart appears around Mario. 1 Jumps lightly in place with excitement. Shell Shield Koops Press a split-second before the shell lands on Mario. 1 Koops waves at the audience. This Stylish Move is similar to the Appeal move. Shell Slam Koops Same as Power Shell 2 Same as Power Shell. Shell Toss Koops Press right after hitting the enemy, then again as he spins for 1 to 1.9 seconds approx. 2 Koops spins upside down, then points up at the ceiling. Smooch Ms. Mowz Press right after the kiss. The player want to press when a heart appears next to Ms. Mowz. 1 Same as Kiss Thief. Stampede Yoshi Kid Press right after Yoshi whistles. The player want to press A when a musical note appears next to him. 1 Same as Ground Pound b.
Tease Ms. Mowz Press as Ms. Mowz is jumping back onto the ground after the attack. 1 Same as Kiss Thief. Veil Vivian Same as Shade Fist, except after enemies attack. 1 Same as Fiery Jinx. Gives very little Star Power. This page was last edited on January 10, 2019, at 19:02.